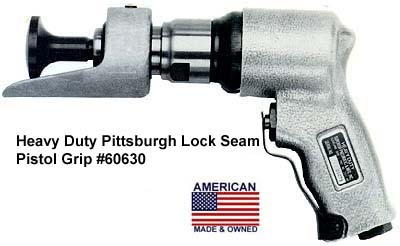 Here's the Pittsburgh Lock Seam Superior Air Hammer that can cut your finishing time up to 80%. 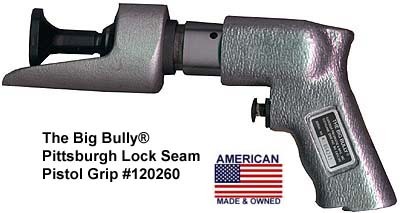 They can be used to fold over or "seam" metal to 22 gauge and lighter on general fabricating, run Pittsburgh Lock Seams on ductwork, tubes, doors, panels, etc. Operators require no special training or skill. The finished seam is neater and more uniform than seams hammered by hand. Fabricating plants using the adapters claim that one operator's production equals that of eight hand-hammering workmen. Lockseam guide can be removed for chisel use. Weight - 2 3/4 lbs. | Air Consump. at 90 psi - 6 C.F.M. Our Heavy Duty units can be used to fold over or "seam" heavy metal 18 gauge and lighter on general fabricating, or run Pittsburgh Lock Seams on ductwork, tubes, doors, panels, etc. Weight - 4 1/8 lbs. | Air Consump. at 90 psi - 6 C.F.M. Weight - 4 1/2 lbs. | Air Consump. at 90 psi - 6 C.F.M. Our Lock Seam Tool closes Pittsburgh lock 16 gauge and lighter. All steel and aluminium construction heat treated for longer life. Don't buy an inferior import! Weight - 5 1/2 lbs. | Air Consump. at 90 psi - 6 C.F.M.